The Steeple Rock district in the Summit Mountains in southwestern New Mexico and southeastern Arizona offers an excellent opportunity to examine the relationship between the distribution and timing of the alteration and the formation of fissure veins in an epithermal environment. Five distinct types of epithermal veins occur in the district: base metals with gold-silver, gold-silver, copper-silver, fluorite, and manganese. These epithermal veins are structurally controlled, are hosted by Oligocene to Miocene volcanic and intrusive rocks, and are spatially associated with two types of alteration: neutral pH (alkali chloride or propylitic to argillic to sericitic) and acid sulfate (advanced argillic). Neutral pH alteration is the most pervasive type of alteration in the district and occurred in three stages: regional pre-mineralization, local syn-mineralization, and regional post-mineralization. The mineral assemblage and geochemistry indicate that the neutral pH alteration was formed by near neutral pH, alkali-chloride fluids at low to moderate temperatures (<300°C). Localized acid-sulfate alteration was formed by acidic magmatic-hydrothermal fluids at temperatures less than 340°C at relatively shallow depths (<1.5 km) as evidenced by mineral and chemical zonations, preserved textures, multiple horizons, stratigraphic relationships, and limited sulfur isotopic data. These acidic fluids were produced by the disproportionation of magmatic sulfur as a result of decreasing temperature as plumes of magmatic fluids rose towards the surface. The epithermal veins were formed by low salinity fluids (<5 eq. wt.% NaCl), slightly acidic to neutral pH fluids at temperatures between 240°C and 340°C at relatively shallow depths (360-1300 m) and low pressures (<1500 bars) as evidenced by preserved textures, fluid inclusion data, mineralogy, and chemical composition. Crosscutting relationships, stratigraphic position, and a few age determinations indicate that the acid-sulfate alteration preceded the epithermal mineralization, but the exact timing and duration of these events is speculative. There is no evidence to suggest that the alteration and epithermal mineralization were continuous; instead events were episodic, waning, and migrating from one locality to another in response to variations in local structurally controlled areas of high heat flow. The Steeple Rock district is one example of the early development of a geothermal system with both neutral pH and acid-sulfate alteration occurring at approximately 31-28 Ma, followed by younger epithermal vein mineralization at about 28 Ma or younger. The Steeple Rock district, in the Summit Mountains (Fig. 1), consists of over 60 mines along northwest-, north-, and west-northwest-trending faults (Fig. 2). Exploration in the district began about 1860, but production did not begin until 1880 (Russell, 1947; Griggs and Wagner, 1966). By 1897, most of the major mines in the district were located and operated by several different companies. Mining ceased in the early 1900s as the near-surface gold and silver veins were depleted. In the 1930s, the price of gold rose from $20.67 to $35 per ounce and many of the mines were reopened. In 1942, the U.S. Geological Survey and U.S. Bureau of Mines evaluated the base-metals potential along the Carlisle fault and concluded that there was insignificant reserves remaining to be mined economically (Russell, 1947; Griggs and Wagner, 1966). The U.S. Federal government closed all gold-silver mines as a result of World War II until after the war. Starting in the 1950s, areas of intense acid-sulfate alteration in the district attracted many geologists to the area. The acid-sulfate alteration in the Steeple Rock district is similar to advanced-argillic alteration characteristic of some porphyry copper deposits. Several theses and a dissertation were completed on parts of the district as exploration intensified (Wargo, 1959; Biggerstaff, 1974; Powers, 1976; Wahl, 1980). An estimated cumulative $10 million worth of metals was produced from the district between 1880 and 1993, which amounts to 151,000 oz (4.7 million grams) Au, 3.4 million oz (106 million grams) Ag, 1.2 million lbs (1.5 million kg) Cu, 5 million lbs (2.3 million kg) Pb, and 4 million lbs (1.8 million kg) Zn (McLemore, 1993). In addition, 10,000 tonnes of fluorspar and 1,800 tonnes of ore containing 33,800 kg Mn were also produced. In the 1970s through the 1990s, exploration, development, and production were for gold, silver, and silica flux for nearby copper smelters. Several recent exploration programs occurred with encouraging results. Drilling by Dresser Industries, Inc. at the Center mine in the 1980s resulted in production from 1988 to 1994 by R & B Mining Co. In 1987, Queenstake Resources, Ltd. examined the Jim Crow, Gold King, and Imperial mines and announced reserves amounting to 141,395 tonnes of ore grading 3.77 ppm Au and 11.3 ppm Ag (Queenstake Resources, Ltd., Press Release, 4/2/87). In 1988, Nova Gold Resources, Ltd. initiated exploration of the Summit vein and in 1990 formed a joint venture with Biron Bay Resources, Ltd. to continue exploration. In 1992, they announced reserves amounting to 1.3 million tonnes of ore grading 6.14 ppm Au and 35.2 ppm Ag (Petroleum and Mining Review, May 1992, p. 2). These reserves have not been mined. Doug Hanson, in a joint venture with Micrex Mineral Development Corp., mined and stockpiled approximately 500 tonnes of ore grading 12 ppm Au and 374 ppm Ag at the Bank mine in 1996 (Rubin, 1997). In 1998, Doug Hanson built a mill at the Center mine to process mine waste piles and remaining ore reserves, but no concentrates have been shipped to date (April 2000). Rocks exposed in the Steeple Rock district consist of a sequence of Oligocene to Miocene (3418? Ma) andesite, basaltic andesite, and dacitic lavas interbedded with sandstones, volcanic breccias, and rhyolite ignimbrites. This sequence is locally intruded by intermediate to silicic plugs, dikes, and domes (33 and 2818 Ma), some of which are associated with epithermal vein formation, brecciation, and faulting. The ignimbrites in the district are outflow sheets that were erupted from calderas in the Mogollon-Datil and Boot Heel volcanic fields. Extensional deformation of the volcanic rocks in the district produced a series of half-grabens and horsts with district-wide, northeastward dips of bedding planes and foliation. The Summit Mountain Formation is named after Summit Mountain in the northern part of the area. It is approximately 240 m thick at the type locality and includes intrusive andesite and volcaniclastic sedimentary rocks, but the base of the unit is faulted. The Dark Thunder Canyon Formation consists of multiple gray to brown to purple to red porphyritic amygdaloidal andesitic to basaltic andesite lava flows with interbedded <28 Ma ignimbrites and volcaniclastic sandstones and is nearly 800 m thick at the type locality. Geochemical data suggest that pre-28 Ma (Summit Mountain and Bloodgood Canyon Tuff) and 2820 Ma (Dark Thunder Canyon Formation and <28 Ma ignimbrites) volcanic rocks represent predominantly lithosphere-derived magmas, with increasing amounts of asthenosphere-derived magmas from 2820 Ma. Two types of alteration assemblages are found in the Steeple Rock district: (1) neutral pH (alkali-chloride or propylitic to argillic to sericitic to silicic) and (2) acid-sulfate (advanced argillic). There are at least three distinct stages of alteration based on crosscutting relationships in examination of outcrops, drill-core samples, and thin sections: (1) regional pre-mineralization, (2) localized syn-mineralization, and (3) regional post-mineralization. These values are consistent with a magmatic-hydrothermal source. Two temperatures calculated from the Steeple Rock data (Bitter Creek) are 339°C and 538°C. The lower temperature (339°C) is a reasonable estimate of the maximum temperature of the alteration, and is consistent with the alteration mineral assemblage. 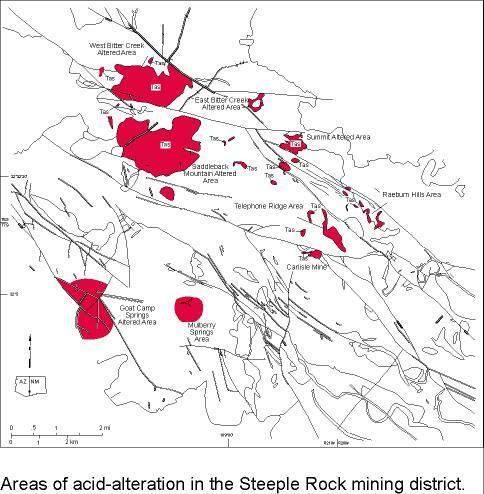 The available geologic, textural (hydrothermal brecciation, hydrofracturing), mineralogic, chemical, and isotopic data indicate that the acid-sulfate altered areas in the Steeple Rock district are a result of magmatic-hydrothermal fluids (Rye et al., 1992; McLemore, 1993, table 2) as evidenced by the high ?34S of alunite from Bitter Creek (Field, 1966), the difference between ?34S of cogenetic alunite and pyrite, mineral and chemical zonations and the similarity in age of alunite with the host rocks. The veins were formed by low salinity fluids (<5 eq. wt.% NaCl), slightly acidic to neutral pH fluids at temperatures between 240°C and 340°C at relatively shallow depths (360-1300 m) and low pressures (<1500 bars). The paragenesis of alteration and mineralization can be divided into six stages: pre-mineralization, four mineralization stages (stage 1, stage 2, stage 3, late), and post-mineralization. The age and duration of these six stages of alteration and mineralization are uncertain and are based upon field relationships and a few age determinations; acid-sulfate alteration is 31 Ma and the epithermal veins are 28-18 Ma. Biggerstaff, B. P., 1974, Geology and ore deposits of the Twin Peaks area, Grant County, New Mexico (M.S. thesis): University of Texas at El Paso, 102 p.
Field, C. W., 1966, Sulfur isotope method for discriminating between sulfates of hypogene and supergene origin: Economic Geology, v. 61, p. 1428-1435. Griggs, R. L. and Wagner, H. C., 1966, Geology and ore deposits of the Steeple Rock mining district, Grant County, New Mexico: U.S. Geological Survey, Bulletin 1222-E, 29 p.
Hedlund, D. C., 1990a, Geologic map and sections of the Steeple Rock quadrangle, Grant and Hidalgo Counties, New Mexico: U.S. Geological Survey, Open-file Report 90-240, scale 1:24,000, 14 p.
Hedlund, D. C., 1990b, Geology and mineral deposits of the Steeple Rock and Duncan mining districts, Grant and Hidalgo Counties, New Mexico and Greenlee County, Arizona: U.S. Geological Survey, Open-file Report 90-239, 27 p.
Hedlund, D. C., 1990c, Preliminary geologic map of the Goat Camp Spring quadrangle, Grant and Hidalgo Counties, New Mexico and Greenlee County, Arizona: U.S. Geological Survey, Open-file Report 90-490, scale 1:24,000. Hedlund, D. C., 1990d, Preliminary geologic map of the Crookson Peak quadrangle, Grant and Hidalgo Counties, New Mexico and Greenlee County, Arizona: U.S. Geological Survey, Open-file Report 90-252, scale 1:24,000. Hedlund, D. C., 1993, Geologic map of the Tillie Hall Peak quadrangle, Greenlee County, Arizona and Grant County, New Mexico: U.S. Geological Survey, Map GQ-1715, scale 1:24,000. Kamilli, R. J. and Rattè, J. C., 1995, Geologic studies of the Mogollon mining district, New Mexico; Does a porphyry system lie below? ; in Pierce, F. W. and Bolm, J. G., eds., Porphyry copper deposits of the American Cordillera: Arizona Geological Society Digest, v. 20, p. 455-463. 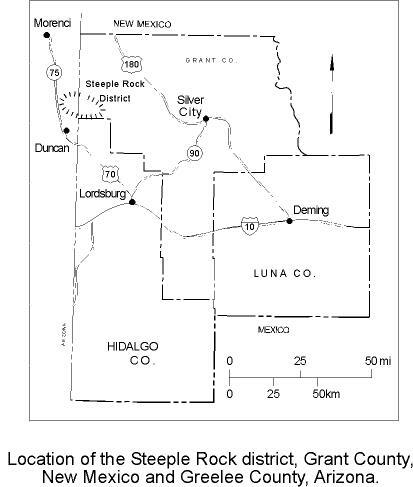 McIntosh, W. C., Chapin, C. E., Ratté, J. C. and Sutter, J. F., 1992a, Time-stratigraphic framework for the Eocene-Oligocene Mogollon-Datil volcanic field southwestern New Mexico: Geological Society of America Bulletin, v. 104, p. 851-871. 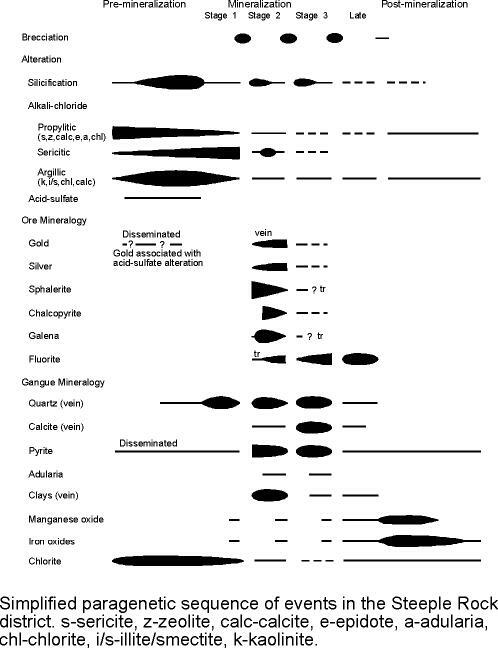 McIntosh, W. C., Geissman, J. W., Chapin, C. E., Kunk, M. J. and Henry, C. D., 1992b, Calibration of the latest Eocene-Oligocene geomagnetic polarity time sale using 40Ar/39Ar dated ignimbrites: Geology, v. 20, p. 459-463. McLemore, V. T., 1993, Geology and geochemistry of the mineralization and alteration in the Steeple Rock district, Grant County, New Mexico and Greenlee County, Arizona (Ph.D. dissertation): University of Texas at El Paso; also New Mexico Bureau of Mines and Mineral Resources, Open File Report 397, 526 p.
McLemore, V. T., 1996, Geology and zoning in the Steeple Rock district, New Mexico and Arizona: Society for Mining, Metallurgy, and Exploration, Inc., Transactions, v. 298, p. 1851-1859. McLemore, V. T., 2000, Alteration and epithermal mineralization in the Steeple Rock district, Grant County, New Mexico and Greenlee County, Arizona; in Cluer, J. K., Price, J. G., Struhsacker, E. M., Hardyman, R. F. and Morris, C. L. 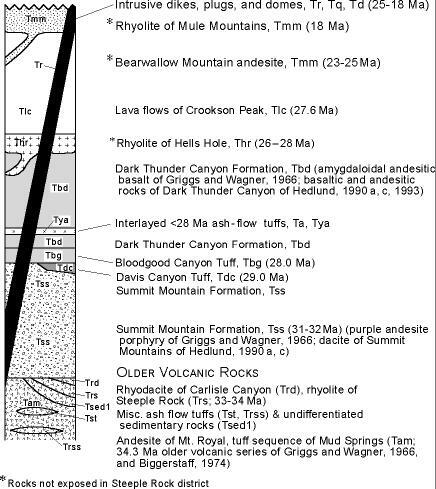 eds., Geology and Ore Deposits 2000, The Great Basin and Beyond: Geological Society of Nevada, Symposium Proceedings, pp. 221-239. McLemore, V. T., McIntosh, W. C. and Applet, R., 2000, Volcanic stratigraphy, geochemistry, and structure of the Steeple Rock district, Summit Mountains, Grant County, New Mexico and Greenlee County, Arizona; in Lawton, T. F., McMillan, N. J., McLemore, V. T., Austin, G., and Barker, J. M. eds., Southwest Passage, A Trip through the Phanerozoic: New Mexico Geological Society Guidebook 51, pp. 127-140. Powers, R. S., 1976, Geology of the Summit Mountains and vicinity, Grant County, New Mexico and Greenlee County, Arizona (M.S. thesis): University of Houston, 107 p.
Russell, P. L., 1947, Steeple Rock zinc-lead district, Grant County, New Mexico: U.S. Bureau of Mines, Report of Investigations 4073, 13 p.
Rubin, B. 1997, Small mines have high hopes too! : Paydirt, March 1997, p. 4-5. Ruff, R. K., 1993, Gas analysis of fluid inclusions: application toward precious metal exploration, Steeple Rock mining district, Grant County, New Mexico (M.S. thesis): New Mexico Institute of Mining and Technology, Socorro, 83 p.
Russell, P. L., 1947, Steeple Rock zinc-lead district, Grant County, New Mexico: U.S. Bureau of Mines, RI 4073, 13 p.
Wahl, D. E., 1980, Mid-Tertiary volcanic geology in parts of Greenlee County, Arizona and Grant County, New Mexico (Ph.D. dissertation): Tucson, Arizona State University, 144 p.
Wahl, D. E., 1983, Comments on economic volcanology between Redrock, New Mexico and Clifton, Arizona (abs. ): New Mexico Geology, v. 5, p. 67. Wargo, J. G., 1959, The geology of the Schoolhouse Mountain quadrangle, Grant County, New Mexico (Ph.D. dissertation): Tucson, University of Arizona, 187 p.